I loved cereal. But then the world changed. America got fat. So food companies took all the good stuff out of things that kids love, and made it crap. Cereal hasn't tasted the same in years. Apple Jacks is the biggest casualty of this. Apple Jacks used to be the best tasting cereal, and then it left behind the perfect cereal milk. Pebbles cereal is the only thing left that kinda tastes like its packed full of the goods, but you can still taste the difference. So along comes Pebbles with marshmallows. How does it hold up? It does OK. It's not amazing. But what cereal is these days? It has the typical gimmick marshmallows that all cereals use with marshmallows, most notably, Lucky Charms. But the pleasant thing is it has the rice cereal with these marshmallows, much like if this was Rice Crispies combined with Lucky Charms. 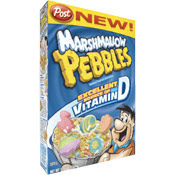 So unlike the other Pebbles cereal, this one doesn't get soggy after 15 seconds of milk hitting it. You should add 2 spoonfuls of sugar to this. Depending on your bowl size. As for the milk thats left behind, nothing special here. If you like cereal with marshmallows and some good sweet kick, then this I recommend. Someday, I promise you all, I will make a video featuring me taking all those nasty oats out of the Lucky Charms and eating nothing but the marshmallows. Did this REALLY need a review? I mean really?